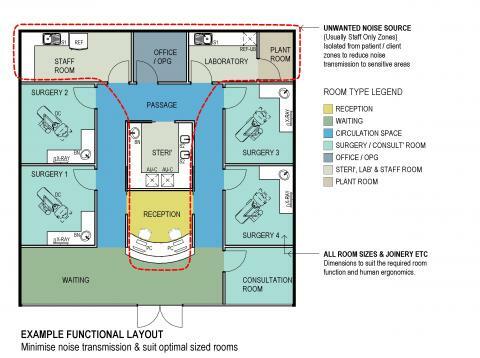 Guide to designing your perfect Clinic. 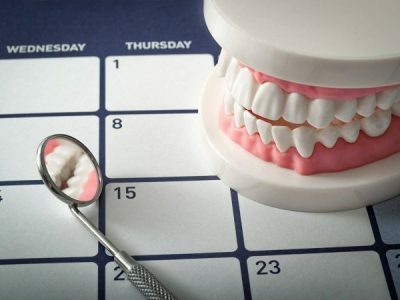 What are some Dental & Medical Floor Layout options? 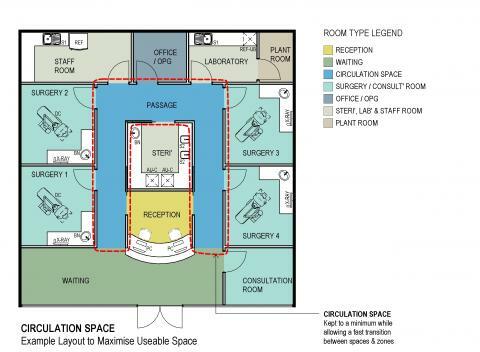 How much space do I need for my fitout? Will my floor layout increase productivity and maximise useable space? 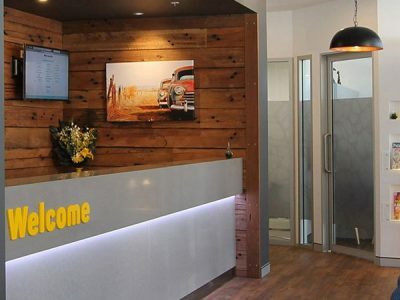 The team at Dentifit will ensure your new dental, medical, veterinary or office fitout interior design will suit your requirements and welcome new patients & clients. All tenancies are different shapes with their own quirks and limitations – a custom & tailored approach will be undertaken by Dentifit when designing your dream fitout. Please use the Quick Enquiry form on this page to request a free consultation, alternatively you are welcome to Contact The Dentifit Office directly. Tenancies come in a multitude of different shapes and sizes with the existing entry door & window positions influencing the final floor layout design. The location of existing services and other site constraints also play a part and need to be considered. Every project is individual and the Dentifit team endeavours to push the limits until all issues are addressed to make your new fitout interior design ‘sing’. 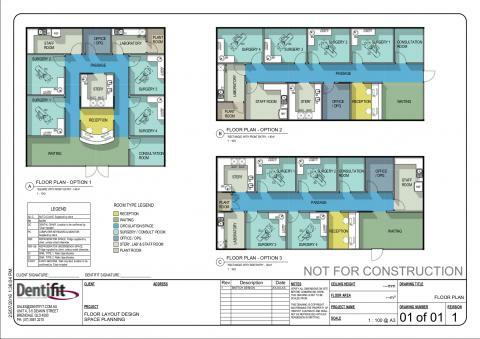 The following are examples of what is possible with a 140m² tenancy of varying shapes and entry door positions – utilising the basic design principals that apply for dental, medical, veterinary & office fitouts. The tenancy size required is determined by how many different rooms you are wanting to accommodate and if you are willing to make any compromises. Ie; Would you consider having a smaller staff room if you could fit in an extra office or consultation room etc? The shape of the tenancy also has an impact on how efficient the space can be used. Ie; Square and rectangles are more functional design shapes then triangles. Triangle shaped tenancies can still be made to work and look great, but there’s a reason why your house and backyard aren’t triangle shaped for example. Ensure the floor layout respects the three zones (public, semi private & private) and provides a gradual transition through the zones. 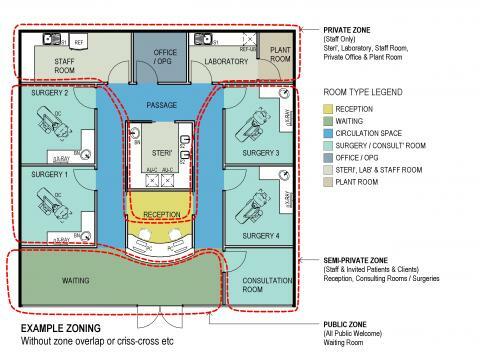 The waiting room is public, the surgeries and consult’ rooms are semi private and the staff room is private. Ie; Ideally a patient won’t pass by the staff room on their way to the surgery or consultation room from the waiting room. Circulation space can easily chew up rooms if used incorrectly. Hallways should be kept to a minimum to maximise the useable space. Ie; An extra 2m of hallway could be used for a consultation room if the designer reallocates space to avoid the need for a long hallway. The floor layout interior design needs to work and take human ergonomics into consideration. Have you gone to take a seat on a bus or train and wished you weren’t so cramped? You definitely wouldn’t want your patients or clients having uncomfortable thoughts before their appointment with you. This is why human ergonomics are so important and they have an impact everywhere. The Dentifit team are well aware of the importance of ergonomics throughout your practice including dental surgeries, consultation rooms & office furniture etc. Noise and the transmission of noise through walls and ceilings also needs to be considered. It is much easier and more cost effective to address noise issues while designing the floor layout, compared to expensive sound insulation measures. Ie; You wouldn’t want your patients or clients to hear staff members in the adjacent staff room discussing what’s for lunch etc, or the hum of plant equipment. Position surgeries and consultation rooms away from unwanted noise sources. Selecting suitable Fittings, Fixtures & Finishes are crucial to achieve your desired interior design aesthetics. Dentifit can guide you through this process and make selections that best suit your desired look, marketing and fitout budget. 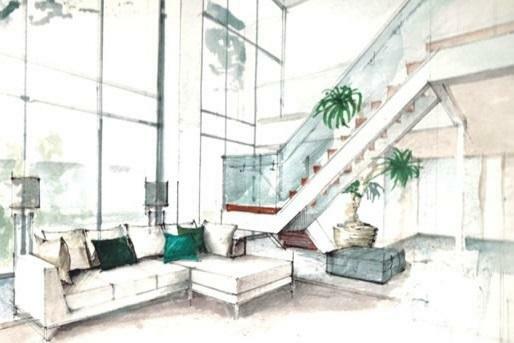 A successful interior design will leave a lasting impression on patients and clients. 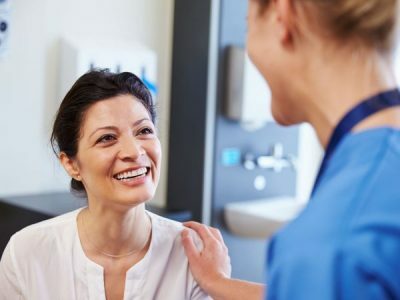 As new patients and clients don’t yet know how to judge your capabilities, it is common for people to reach their lasting first impressions by other means – how well the interior design positively impacts them. A great interior design has the potential to influence new patients and clients to believe yourself and fellow practitioners are well equipped to meet their needs.